Protein is an essential macro nutrient, universally considered the body’s fundamental building block. Little talked about or recognized, protein deficiency can play havoc with your regular health condition. Despite abundant protein resources available to us, people tend to experience dietary protein deficiency owing to wrong food choices. Some of the reasons for this problem may be severely restrictive diets either due to lifestyle or religious reasons, lack of knowledge about nutrients, and inability to afford nutritious foods. Every cell, tissue and organ in the body contains protein. The digestive process breaks down protein in food into amino acids, which are absorbed and then assembled in the body into required proteins. Amino acids that cannot be made in the body and can only be acquired through diet are known as essential amino acids. Proteins help build muscles, produce new cells, regulate hormones and enzymes, heal wounds and promote immune function. According to the Institute of Medicine, adult females require at least 46 grams of protein per day; adult males need at least 56 grams of protein. Low dietary protein is more common in developing countries due to inadequate access to protein-rich foods. However, it can affect people in developing countries who make poor dietary selections. A simple blood test can be performed to identify if protein deficiency is the problem. If you do not take sufficient protein required to supply the necessary amino acids, your body is left with little choice except to start breaking down your muscles to get amino acids from their fibers. Some protein rich foods are Yogurt, Cheese, Eggs, Milk, Whey Protein, Green peas, Wheat germ, Poultry and meat products, Dry lentils, Peanut butter, Mixed nuts, and a variety of Seafood. According to Jessica Bihuniak, PhD, RD, Assistant Professor of Nutrition at New York University’s Steinhardt School of Culture, Education, and Human Development, one important part of the body to watch out for signals of the problem is the clavicle. If your collarbone is becoming especially prominent, it may be time to make sure you’re eating enough protein and enough calories in general. 1. Constant food cravings – Constant food cravings and reaching for snacks can be a sign of protein deficiency. Protein balances out blood sugars, evening out glucose levels. 2. Muscle and/or joint pain – Protein is critical for building and rebuilding muscle tissue, so it makes sense that a deficiency would cause muscle pain. Brown University research has shown that protein also plays a pivotal role in the synovial fluid that surrounds joints, preventing them from wear and tear. When dietary protein is lacking, the body pulls from its reserves in both the muscles and joints. As a result, muscles tighten and ache, and joints stiffen. 3. Thin hair with skin and nail alterations– Hair and nails are made up almost entirely of protein and are strong indicators for even the slightest deficiency. Hair prone to splitting or breaking, and brittle or ridged nails can indicate a lack of protein in your diet. Skin rashes, which may be accompanied by dry or flaking skin are a symptom of a protein deficiency. These rashes are caused by extreme protein deficiency and may resemble eczema or other dry skin rashes. 4. Edema (swelling) – Protein plays an integral role in keeping excess fluids from accumulating in tissues as blood travels through the body. Research has shown that when protein levels are insufficient, fluid tends to build up in tissue, most notably in hands, feet, ankles, and cheeks. The bloated sensation of one’s swollen lower legs and feet—called edema—is uncomfortable. It usually results in stretched or shiny skin that retains a fingerprint after being pressed for a moment. 5. Frequent illnesses – Protein is key to a strong immune system. It’s the foundation of red blood cells, white blood cells, and antibodies, all of which work together to fend off bacteria, viruses, and other pathogens in your body. 6. Muscle Wasting – A lack of protein in the diet can cause muscle soreness, weakness and cramping. Protein supports muscle growth and strength. A lack of protein in your diet reduces muscle strength, muscle function and decreases lean body mass. You also lose body fat, because protein provides structure for adipose tissues. The wasting away of muscle and fat tissue is known as cachexia. 7. Gastrointestinal Distress, Lethargy and Apathy – Low protein stores cause you to feel lethargic, fatigued and weak. You may also experience headaches, nausea, diarrhea, soreness of the stomach and even fainting. 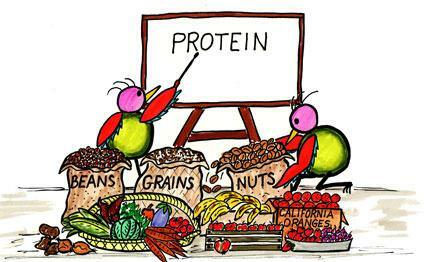 Protein helps transport nutrients within the body, delivering and releasing them where they are needed. When protein cannot perform this function, it disrupts the body’s homeostasis. This may result in a loss of appetite, irritability, insomnia, apathy, and the inability to stay warm. 8. Slow Healing – Amino acids, the building blocks of protein, are crucial in wound healing. When your body heals itself, it needs to repair or produce tissues. These tissues use amino acids in the repairs, and a lack of protein can lead to a slower building process. 9. Difficulty Sleeping – Difficulty in sleeping could be caused by a serotonin deficiency, which is caused by a lack of certain amino acids. These amino acids are produced when protein is broken down, and a diet with insufficient protein could lead to difficulty in sleeping.